Game Informer broke the news on Saturday based on their discussion with Konami during a preview event that took place sometime prior to the beta going live last week. Per the developer, the persistent online connection is to ensure "a seamless integration between single player and co-op" and "provide ongoing content post-launch." As for the real money purchase side of things, players will be able to buy an in-game currency that can be spent on a variety of boosts that will increase the drop rate for a variety of currencies and provide other bonuses. It's worth noting that the in-game currency used to acquire these boosts can be acquired by playing as well. Neither of these features are exactly surprising, given the way things went with Metal Gear V post-launch. Still, while it obviously makes sense to require an online connection for the online co-op mode, requiring that same connection when playing single-player is definitely problematic for folks with bandwidth caps and/or a spotty Internet connection. As for the microtranscations... well, barring an in-game pachinko machine, that seems like the easiest way for Konami to continue earning money from the title post-launch. Hopefully those boosters aren't so vital as to make it feel necessary that you have to have them in order to progress. Metal Gear Survive will launch on February 20, 2018 on the PlayStation 4, Xbox One, and PC. 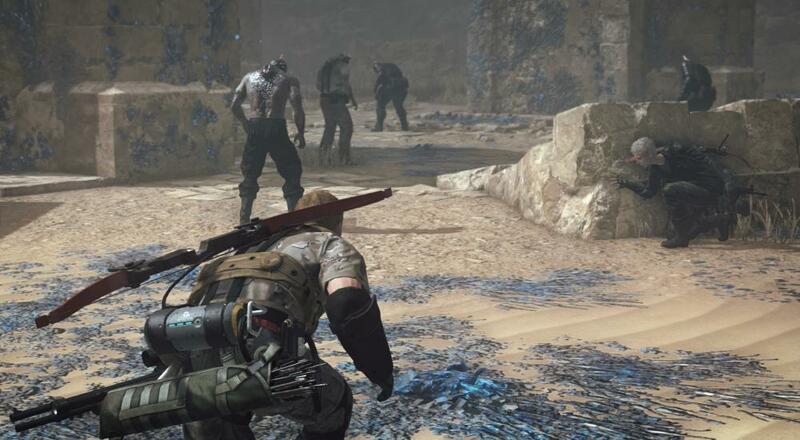 It will support four player online co-op in a wave-based survival mode that's separate from the single-player campaign. Page created in 0.4246 seconds.